If you�ve been searching for a baby shower favor that will not be forgotten, this little favor will leave a big impression. 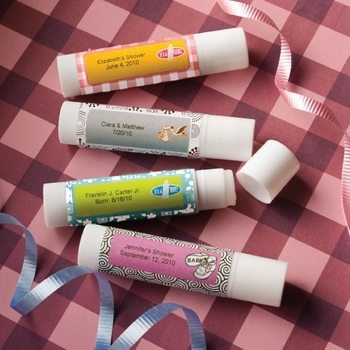 Not only are these lip balms a fun choice, but they will be useful for a long time as well. Each personalized tube measures 2 3/4 inches long with a 5/8 inch diameter. Includes the standard twist bottom to raise the moisturizing vanilla flavored lip balm as required. The self sticking labels that you can design will make these unique to your event. Our easy design application allows you to see what your labels will look like as you try different elements to create the perfect favor for your party! We have a large collection of different motifs and colors to choose from. Just add your custom title and date, and voila...you have it! The self adhesive label sheets will ship with your order. Note - Assembly required: You apply stickers to each candle. The lip balm tubes will be bulk packed in individual poly bags.